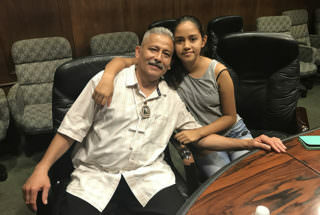 Romulo Avélica-González with his daughter Fatima one day after his release, at MALDEF offices in Los Angeles. At the end of six months in detention where he was one step away from deportation, the father arrested by ICE agents outside his daughter’s school celebrated his freedom Friday and urged immigrant parents to fight fear and keep taking their children to school. 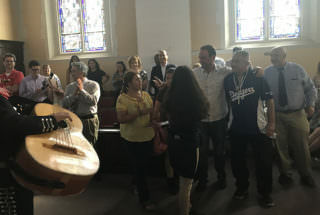 Although he is 20 pounds lighter because of complications from diabetes while he was in custody, Avelica-González’s eyes shone as he was surrounded by his family again, along with the academy’s staff and 400 middle and high school students. The national attention his case has attracted since his arrest should serve as an example, Avélica-González told LA School Report in an interview on Thursday, the day after his release, at the MALDEF offices in downtown Los Angeles. “I am not the example, but my case, so that other families do not go through the same thing. Know your rights and move on. And above all, continue with the routine of taking your children to school every day. It is their right. His joy, however, was tempered as his community waited to hear whether the Trump Administration would terminate DACA, the Obama Administration order that has shielded hundreds of thousands of undocumented students from deportation. 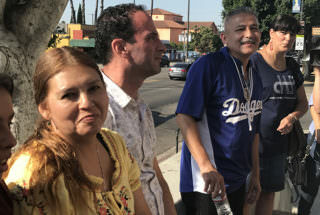 Romulo Avélica-González is joined by his attorney Alan Diamante, center, his wife Norma Avélica, left, and other supporters on Friday morning outside Academia Avance in Highland Park. The Mexican immigrant, who arrived in the United States more than 25 years ago, believes that his arrest occurred in the wrong way and place. “It should not happen like this” outside a school, he said. Avélica-González was released on bail late Wednesday from the Adelanto Detention Center, but his case is still in process. His wife, Norma, has applied for a U visa that would also protect him and allow both of them to stay in this country. The U visa is awarded to people who have been victims of violent crime, as his wife was last December. The choice of Academia Avance was “to get better care” for the girls, as the school is considered “the best neighborhood option,” Norma Avelica said. That Avélica-González’s arrest occurred outside a school caused much indignation in the immigrant community, as well as among educational and civic leaders. Los Angeles Mayor Eric Garcetti wrote a letter in support of Avélica-González after the arrest. “The sensitive locations policy is vital to ensuring that immigrant and mixed status families feel safe sending their children to school. The national attention drawn by Mr. Avélica’s arrest — and potential deportation — heightens fears among immigrant communities that could prevent children from attending school,” Garcetti stated in the letter. The Avélica family listens to mariachi music during the Academia Avance school assembly on Friday morning at the Highland Park Presbyterian Community Church. “Starting in February, we decided to be more proactive as a school at Avance to help our families be ready for this kind of situation,” said Mireles, who joined with other charter school leaders to form the California Schools Are Sanctuaries (CASAS) coalition. Zenzontl Kuauhtzin, director of parent engagement for PUC Schools (Partnerships to Uplift Communities) and co-founder of CASAS, said during Friday’s school assembly that the Avance community was an inspiration to many educators in Los Angeles and throughout California. “All the schools, all the students, all the educators were inspired by you. We join in calling for all school districts in the state to adopt the ACLU resolution and the toolkit to implement school regulations that will ensure that no families are afraid in our schools,” Kuauhtzin said. During the school event, Mireles noted that he could see a difference in Fatima, whom Mireles refers to as “the Rosa Parks of this era.” Her face shone with smiles, which he said had been erased during the time her father was in custody. “In addition to my teachers and Mr. Mireles, my friends and many of my classmates knew my dad and gave me a lot of support,” said the ninth-grader, who has already chosen her career path.